The South African National Museum of Military History, situated in Johannesburg, is the only museum of its kind in South Africa. 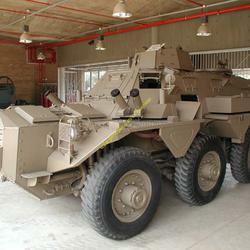 It provides a nucleus of Museum and military history expertise in southern Africa. The Museum's collection of more than 44 000 items are divided into 37 separate categories and include the official South African war art and photograph collections. The Museum library has a unique collection of books, journals and archival material. Interviews are regularly conducted in the library as part of an ongoing oral history collection project. In this way, it ensures that previously unrecorded experiences of ordinary servicemen and women are preserved for posterity. * A home for the memory and study of the military history of South Africa. * The museum offers visitors a rare opportunity to view the actual artifacts of our past. * a wide variety of programs and educational tours for schools covering course material for Grades 5-9. * Special tours can be arranged to cover a specific topic and can be made suitable for all ages. The Museum is situated in Erlswold Way in the northern Johannesburg suburb of Saxonwold adjacent to the Johannesburg Zoo and close to the recreational area of Zoo Lake, and is open daily from 9am-4.30pm (excluding Good Friday and Christmas Day). Tours of the museum are available during the week between 9am-3pm.